By now, you have probably heard about Thermography in relationship to your breast health. At ThermApproach, one of our top priorities is your breast health. 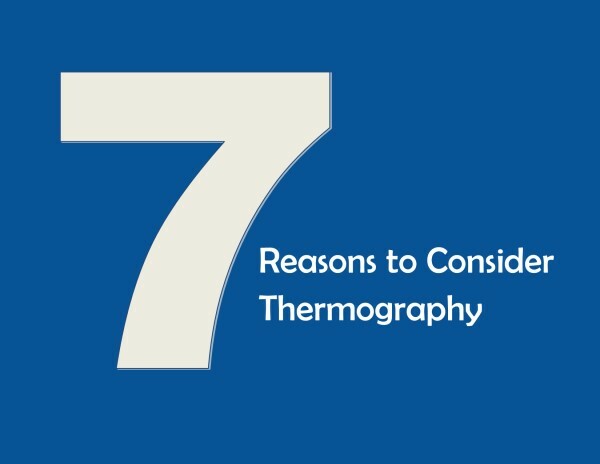 We’d like to offer seven reasons to consider Thermography. Interestingly, many people believe Thermography is a new reality, however, it isn’t. In fact, it was once the standard for breast imaging before the mammography machines took over. There’s no poking, prodding or squishing when you get a thermogram. Rather, it’s done using an infrared camera that takes photos of your breasts. That’s it. No pain involved. If you have tender breasts, implants, or dense breasts, you name it – thermography is your no-pain, non-invasive option. Did you know that every time you get compressed you receive radiation? And if you happen to have dense breasts your tissue is absorbing even more radiation? Thermography emits zero radiation. It emits nothing. It’s just a picture. Because of this, it’s safe for all women, even pregnant women. Thermography is a test of your breast physiology; therefore, it detects changes in your breast health as they happen, at a cellular level. Because mammography is a test of structure like an X-ray, a pathology has to wait until its big enough to be seen on a mammogram before it's detected. Thermography can detect changes in your breast tissue 8-10 years before other standard cancer detection tests – i.e., mammograms. 8-10 years – that’s a long time. According to Philip Getson, D.O. this is because thermal imaging detects changes at the cellular level. Seeing breast health changes early allows you to reverse breast health with lifestyle changes. At ThermApproach, our prices range from $150 - $295. Because we are committed to enabling our patients to obtain and maintain health and wellness naturally, and the services provided by us are based upon a preventative approach, it is rare that they are covered by insurance companies. It will likely be denied by your insurance company as “not medically necessary." The FDA accepts thermography as an adjunct to other clinical diagnostic procedures. In other words, if you’ve had a mammogram, you should also get a thermogram! All of our thermograms are interpreted by licensed Medical Doctors who are Board Certified in Thermography through the American College of Clinical Thermology in addition to their own specialty. All studies are performed by Certified Clinical Thermographers. Now that you know why you should have your pictures taken, please call our office at 419.509.2249 and schedule your thermogram today. Before you can feel it, thermal imaging can see it. [i] Lawson R. Implications of surface temperatures in the diagnosis of breast cancer. Can Med Assoc J. 1956;75(4):309-311.